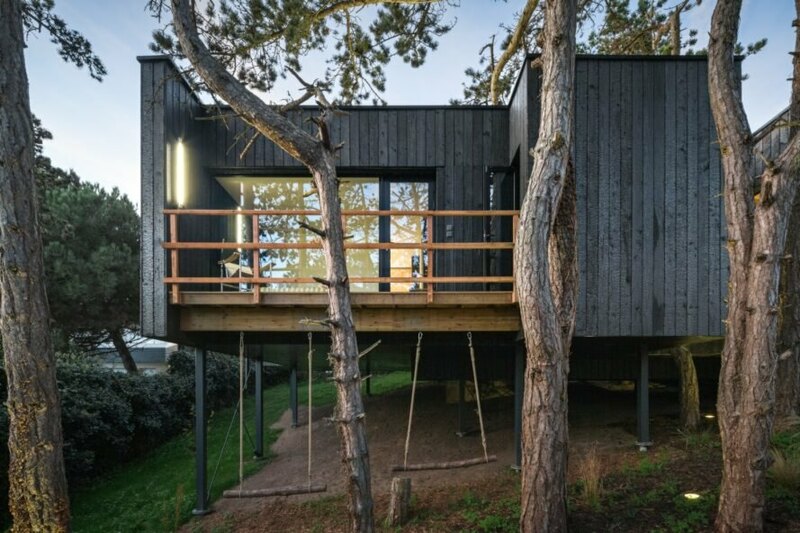 Architectural firm Atelier Victoria Migliore may have left its home base of Paris to design a beautiful treehouse-inspired family home in northwestern France, but the company made sure to bring its Parisian sense of style with it. Tucked into an idyllic forest landscape, the rustic, sophisticated home, which features a surprisingly modern interior design, was built on stilts to reduce the home’s impact on the landscape. No trees were felled during the construction process. 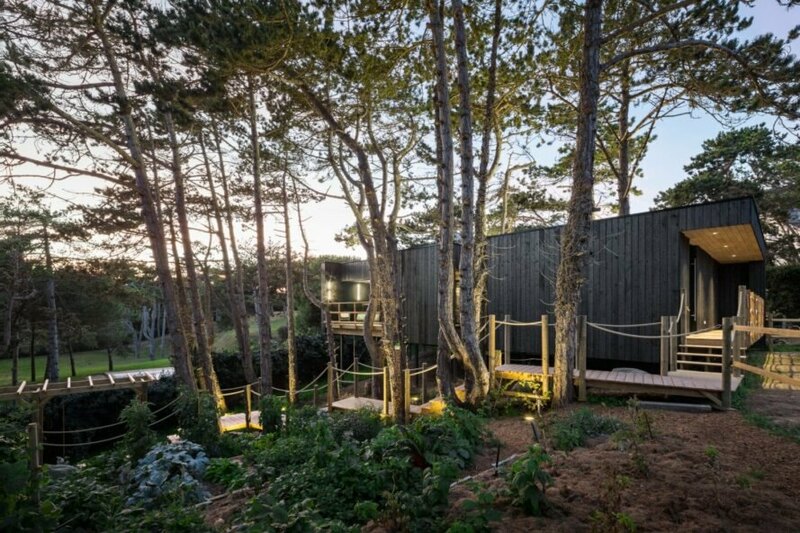 Located in Fréhel, in the Brittany region of northwestern France, the “treehouse” sits on a sloped landscape in the middle of a pine forest. As the construction began, the architects aimed to protect the idyllic natural state of the surroundings; therefore, not one tree was felled. To reduce the home’s footprint, the structure was raised between 3 feet and 9 feet off the landscape using deep screw piles. Following the natural topography, a long, roped wooden walkway leads from a lower ground level and wraps around the home’s edge, slowly rising up to the entrance. 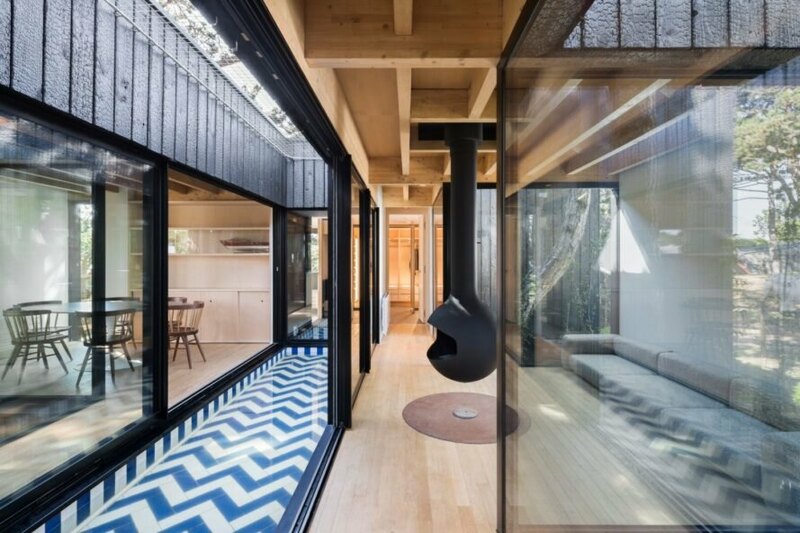 The home is comprised of several rectangular volumes, all clad in charred timber, arranged with wide spaces in between to create several open-air terraces. Punctuated by extra-large windows, the volumes were also oriented to provide stunning views from virtually any angle inside the home. The angular windows frame incredible views but also provide a strong harmony between the living spaces and the outside world. 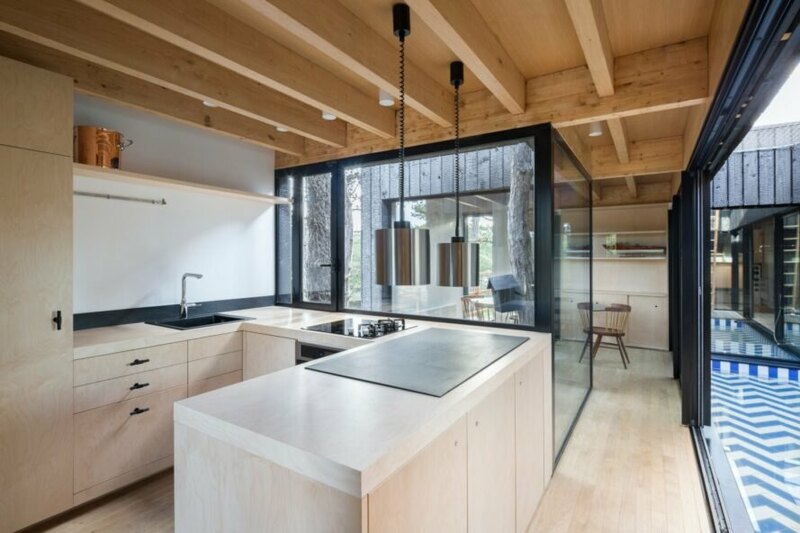 Throughout the interior, large trees feature prominently, even up through an interior courtyard‘s wooden flooring. In addition to its connection to nature, the home’s 900-square-footage includes any number of surprising features. In the center of the home is a central walkway that stands out with blue-and-white zigzag tiling. When the homeowners are feeling the need to truly immerse themselves in the outdoors, there is a hammock that is hung between the rooftops of two of the home’s volumes, creating a serene spot for reading, napping or just breathing in the fresh air. 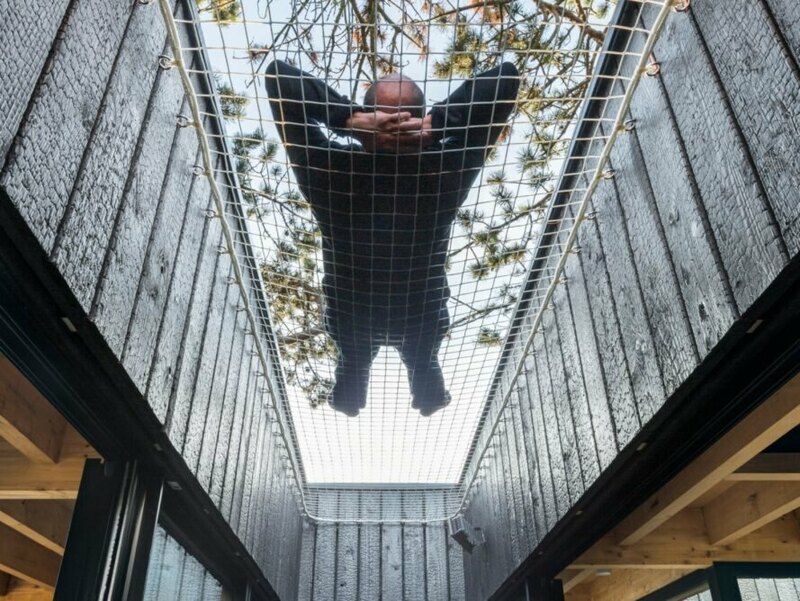 Architectural firm Atelier Victoria Migliore designed a 900-square-foot home inspired by treehouses. The home is elevated off the landscape by deep screw piles. The home's many rectangular volumes rise and fall with the natural topography. 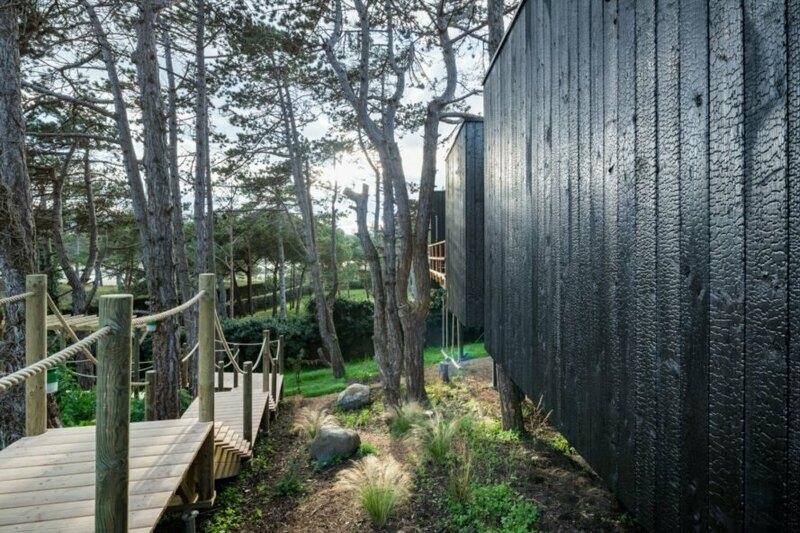 The home is clad in charred timber panels. Not one tree was felled during the home's construction. The interior boasts a modern design with whimsical touches. The kitchen space is bright and airy with large exposed ceiling beams. A walkway made of zigzag tiles is a central component of the design. 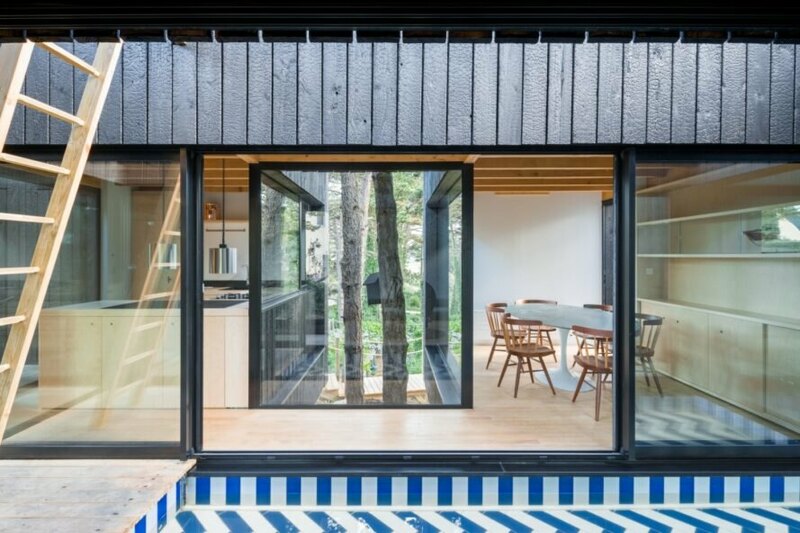 Thanks to large glass windows and sliding doors, the home has a strong connection to the outdoors. A wooden ladder leads up to the rooftop. White walls and natural wood features create a soothing living space. 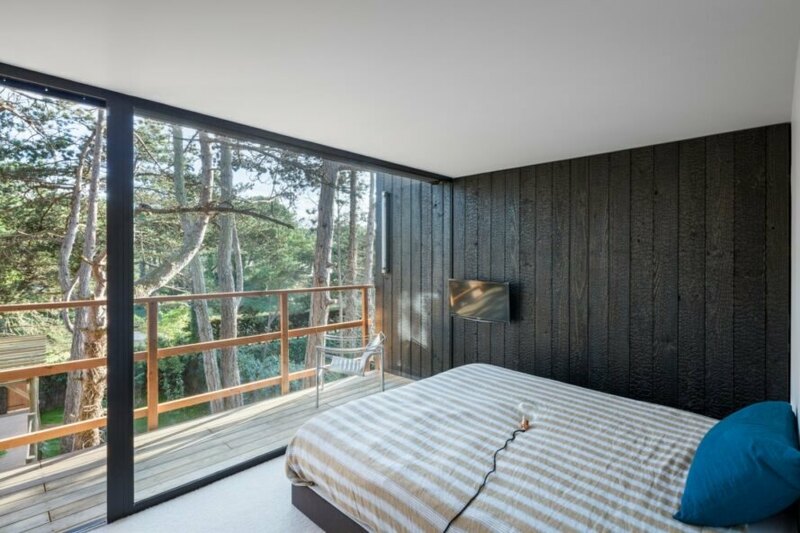 The master bedroom features an open-air terrace. One quirky feature is the large hammock that hangs between two rooftops.